Part absurdist performance, part “kinetic junk sculpture installation,” machines machines machines machines machines machines machines tells the story of three isolationist American technophiles who, in an attempt to simplify their lives and protect themselves from the outside world, bury themselves in a cacophonous landslide of ingenious (if poorly made) machines. Machines machines machines machines machines machines machines paints a portrait of contemporary American life as a place of deep-seated paranoia of the outside world, thinly veiled by an obsession with “make-your-life-easy” technology. 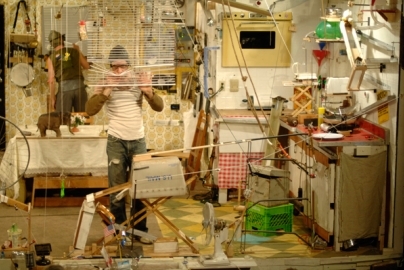 The play is told through a series of absurd “Rube Goldberg-like” machines that follow the simple equation: “The greatest amount of effort for the least amount of gain.” Hence, a spoon at “point A” pulls a flower pot from “point B”, releasing a ball at “point C” to careen down a drain pipe, “point D”, sending a bowl descending to “table E”, to receive falling cereal at “point F”. The ridiculous playfulness of the machines, however, ultimately reveals a darker stream: as we grow more and more consumed by fear and xenophobia, we draw more and more attention and suspicion until we become the thing we fear.